Geraniums are commonly grown in gardens as they are easy to maintain and have great use in the garden as an attractive plant that provides ground coverage. Geraniums plants are half hardy or hardy perennials that range in height from 10 cm to 60 cm. 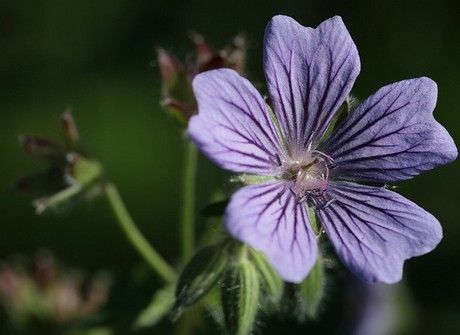 The foliage of the Geranium consists deeply cut lobed leaves, and they bloom from spring through to summer with naturally circular pink or purple flowers (though there are many other Geranium varieties with a multitude of colours available for use in the garden). Visit this page of GardenersHQ for a full guide on how to grow Geranium sanguineum. Geranium photographs: Geranium thunbergii by TANAKA Juuyoh (田中十洋), and Geranium Stéphanie by Alexandre Dulaunoy. 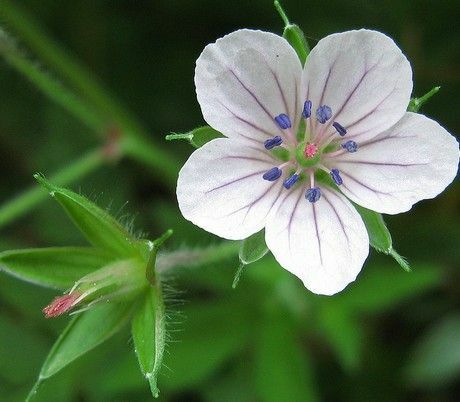 Some common names for members of the Geranium plant genus include Cranesbill, Mourning widow, and Geranium. Common Names: Geranium, Cranesbill, Mourning Widow. Life Cycle: Hardy perennial. Half hardy perennial. Annual. Height: 4 to 24 inches (10 to 60 cm). Native: Worldwide; temperate, high tropical areas. Flowers: Species dependent: Spring and/or summer. Flower Details: Purple, pink, white, blue.. Saucer shaped. Five petals; radially symmetric. Sow Outside: Cover seed. Late in autumn. Spacing 8 to 12 inches (20 to 30 cm). Germination time: three days to three months weeks. Seed: Method 1: Seeds should first be sown into flats in the autumn. Next sink the flat into the ground in an area that offers shade, preferably close to a wall that faces north. Provide a glass/plastic covering. Keep an eye on the flats to ensure that the soil remains moist. Bring the flats indoors at the beginning of spring and keep at 70 to 75°F (21 to 24°C). Transplant seedlings following the last frost. Seed: Method 2: In the spring, mix seeds in a moist growing medium, then put in flats, wrap in a large plastic bag, then stratify by refrigeration for three weeks. Next bury the flat as described above. Once seedlings emerge transplant them to their final location. Requirements and care: Full sunlight or partial light shade (many species must have full sunlight). Good drainage. Soil pH 5.5 to 7.0. Ordinary soil. Keep soil moist in hot areas. Provide support with a twig. Cut back after flowering to encourage a second bloom. Winter mulch in colder regions. Propagate: by dividing in the spring in cold areas or the autumn in warm regions; or take summer semi-ripe cuttings. When growing Geraniums from seed they can be sown in spring or autumn. In both cases sow the seeds into flats and lightly cover. If sowing Geranium seeds in autumn then place the flat in a shady part of the garden, cover with glass and keep moist. Transplant the Geranium seedlings to their final location just after the last frost of spring. If sowing out in the spring, then place the flats into a plastic bag and put in the fridge for three weeks. Following this time sink the flat into a shady part of the garden, cover with glass and keep moist. When young Geranium plants appear transplant them to their final location. 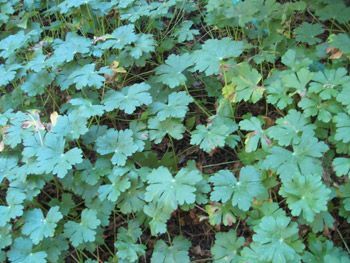 It can take from a couple of days to three months for Geranium plants to germinate. They can grow in either sunny or partially shaded parts of the garden and should be spaced at between 20 and 30 cm apart. Ideally the soil that Geranium grows in should be slightly acidic to neutral (pH 5.5 to 7), and moist. It is easy to care for geraniums; they prefer a moist soil when it gets hot so water regularly in the summer. Once the first bloom has finished cut back the plant; this should result in a second bloom. In cold areas, mulch for the winter. 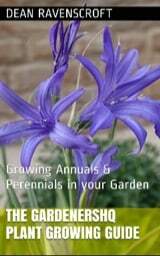 If you require more plants then propagate by division in spring or autumn.